Former Governor Terry Branstad’s opening appearance with the five other Republican candidates who’re running for governor was a bit rocky. Each of the candidates was given 10 minutes to speak on Saturday night during an Iowa G.O.P. fundraiser in Des Moines. Branstad was second in the line-up, and he opened by directly addressing some of those who’ve questioned his bid for a fifth term. Branstad read from prepared remarks and the crowd, at times, hestitantly responded to lines designed to drawn their applause. Branstad closed by telling the crowd he loves the state of Iowa and is willing to make the “sacrifice” to lead it again. “And I believe with your help we can see a state that will be, again, balanced with a budget balanced on fiscal, on generally accepted accounting principles, that abides by fiscal responsibility, a state that focuses on jobs — private sector, quality jobs and good education and one that we can all be proud of. 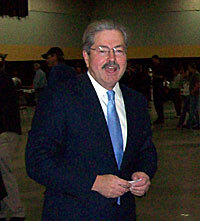 Are you ready to see that happen?” Branstad asked, as a few in the crowd responded with, “Yes.” Others applauded. Rival Bob Vander Plaats, the next in line to speak, opened by welcoming Branstad to the race, but Vander Plaats quickly suggested voters weren’t looking for politicians, they’re looking for “real world” leaders. “If we’re going to win it needs to be about ‘We the People’ not about “We the Establishment,'” Vander Plaats said. Vander Plaats suggested Republicans were at a crossroads in 2010. Chris Rants, a Sioux City legislator who was last in line to speak, suggested Republicans need to do a little soul-searching. The crowd of about 500 went silent when Rants told them more people had attended a “tea party” rally earlier in the day than were there at the GOP event. Three other G.O.P. candidates addressed the crowd, including state legislators Jerry Behn of Boone and Rod Roberts of Carroll. Cedar Rapids businessman Christian Fong told the crowd if he’s elected, he’d like to do away with the state income tax.